A view by W. Schellinkx of Strada del Salvadore Fuori la Mina, near Pinto Stores, Valletta, where the Pace family lived in the 1780s. After years of research in Malta and abroad, I have finally published a documented biography of Dr Giuseppe Elia Pace. 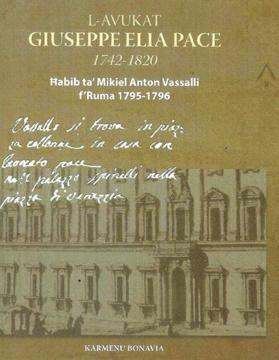 The book, entitled L-Avukat Giuseppe Elia Pace 1742-1820, Ħabib ta’ M.A. Vassalli f’Ruma, was inspired not so much by what Pace achieved in his political career, as a judge and minister in the Roman Republic (1798-1799), but mostly by his friendship with Mikiel Anton Vassalli. Both lived together in Rome for about two years between 1795-1796. While Vassalli was very active in an academic career of teaching, research and preparing the publication of his Mylsen and Lexicon, for which he was in dire need of money, Pace who was living in exile, was dreaming of higher political achievements. During these years, Vassalli engaged in some commercial activities in cotton yarn and imported sugar to sustain himself and his publications. On one occasion, he had some difficulty with his Maltese agents Gioacchino Camenzuli and Giuseppe Caruana from Vittoriosa. At one point these even commissioned their courier Felice Attard to trace Vassalli in Rome. Having met him, Attard wrote his address stating: Vassalli si trova in Piazza Colonna in casa con l’avocato Pace nel Palazzo Spinelli nella Piazza di Venezia (Vassalli was living with lawyer Pace in Piazza Colonna, in Spinelli Palace, Piazza Venezia). Note written by letter courier Felice Attard after finding Vassalli living with Pace in 1796. But who was this Pace with whom Vassalli was staying? The biography was inspired by a brief but very good article published in 1936 by D. Gladiamagna (a nome-de-plume for Domenico Spadoni) in the Archivio Storico di Malta. 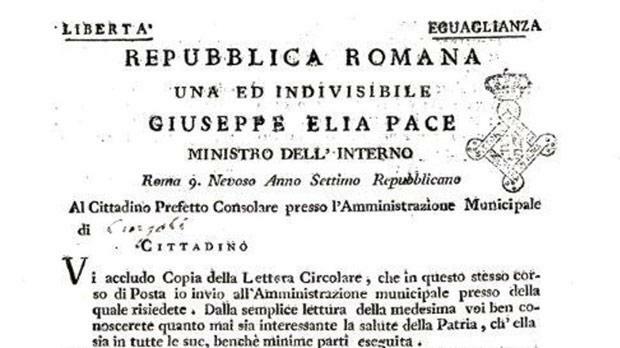 This publication described Pace as a Maltese, tracing the salient points of his political career in the Roman Republic of 1798-1799. 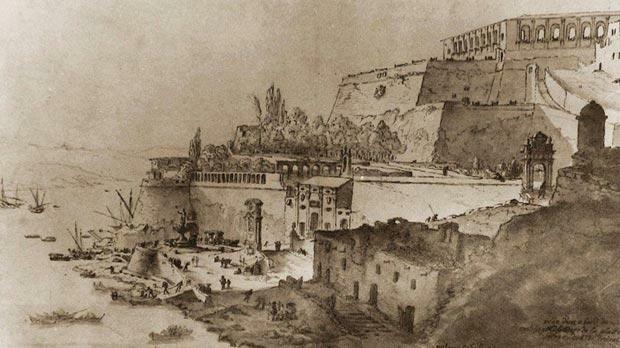 Then, more recently, Judge Emeritus Giovanni Bonello referred twice to Pace in his Histories of Malta (Vol II and IV), quoting from a manuscript, which forms part of his private library, written in mid-19th century by Fr Carmelo Griscti (1811-1883). 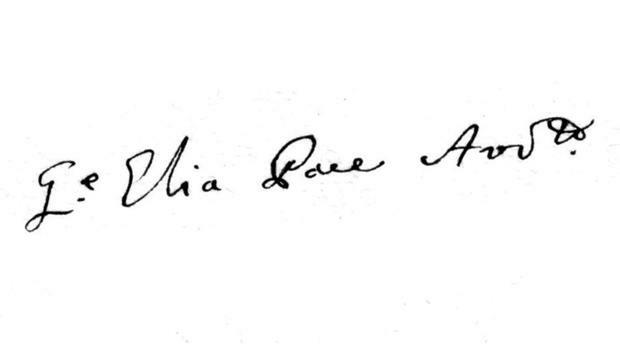 Pace’s signature taken from a lawsuit dated November 6, 1780. In this six-line document, Griscti only gives the date of Pace’s birth in Valletta, the names of his parents, his being a doctor of laws, and his exile when his name was cancelled from the lawyers’ registers in Malta. I delved into several archives and libraries, hoping to find more information about Pace. With the help of friends I managed to compile a biography of this Maltese lawyer who reached a high position in the Napoleonic regime of Rome. 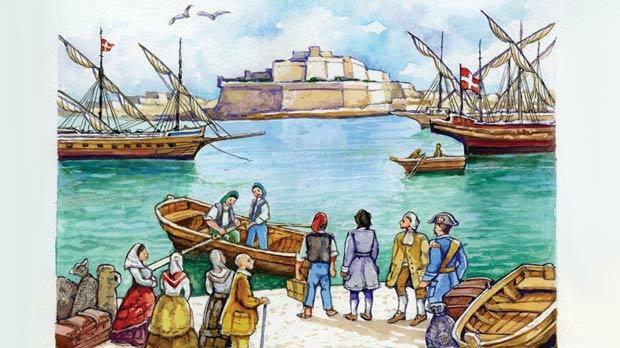 Pace was born in Valletta on August 22, 1747, the son of Fran­cesco and Paolina Debono. The following day he was baptised at St Paul’s parish church, Valletta, and named Salvatore Giuseppe. In the 1770s, according to the records kept at St Paul’s parish, the family consisted of Gioacchino, Giu­seppe, Giovanni, Rosa, Maria and Margarita. They lived in Strada del Salvadore, Fuori la Mina, outside Pinto Stores on the Valletta Waterfront. There was also another member of the family, named Ciro, who was a lawyer living on his own. The family gave great importance to the education of their children. Gioacchino became a priest and later archpriest of St Paul’s parish, Giovanni was a cleric, while Salvatore Giuseppe became a lawyer. The latter immediately started and continued to be known as Giuseppe Elia, perhaps owing to some connection with the Carmelite Fathers or family devotion to Our Lady of Mt Carmel. The forced loans imposed by French general Claude-Henri Belgrand de Vaubois in 1799 on the families besieged in Valletta show that the Pace family enjoyed a satisfactory financial status. In 1780, Pace started his legal practice in the Maltese law courts. The earliest lawsuit known at the Magna Curia Castellaniae bears the date April 4, 1780, regarding a payment that Palmo Gatt owed Andrea Vella. Pace also appears in the court on other similar money cases, such as inheritance, debts, ground rents, pledges not honoured and land rent at Il-Pwales. He himself also sued Michele Portelli and Michele Grech for unpaid legal services due to him. A watercolour by George Apap showing Pace being exiled on September 8, 1785. Another Apap watercolour showing Pace and M.A. 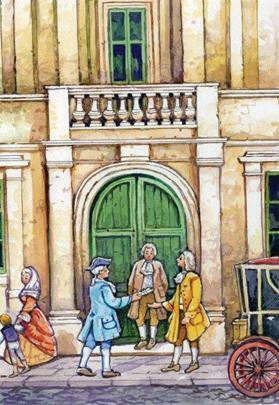 Vassalli receiving a Maltese courier with a letter at Palazzo Spinelli in 1796. The last time he appeared in court was on August 6, 1785, in an appeal filed against Giuseppe Dingli by Petro Mallia. However, 11 days later, Pace, together with Gaetano Schembri, were arrested on order of the Grand Master. On September 5, Schembri was set free but two days later, Pace was condemn­ed to row on the galleys. On September 8, 1785, he was exiled from Malta after he had been declared ‘infamous’ and his name struck off the lawyers’ registers. When he was first exiled, Pace went to Naples. There he be­friended some Jacobins who later accompanied him to Rome. Four years later, he succeeded to return to Malta on the recommendation of Queen Caroline of Naples. After less than three years, the Grand Master again exiled Pace, who this time headed for Rome, perhaps to join a relative of his who was living there, Alberto Pace, son of Giovanni Battista, also born in Malta. In order to discover the real reason for Pace’s exile one has to look through the correspondence between Michele Benedetto Grimaldi, Naples’s ambassador in Malta, and Lord John Acton, Prime Minister of Naples. Grimaldi used to keep Acton regularly informed of the events developing in Malta during that critical period. On October 11, 1792, Grimaldi asserted that Grand Master Emmanuel De Rohan was very sensitive about those who could not restrain themselves from expressing republican ideas and spoke publicly against the government of the Order. It seems that Pace had expressed his ideals and he was considered a suspect and threat to peace and tranquillity “which were so much needed in this island”, wrote Grimaldi. In fact, in this same letter, the ambassador gives a list of six people who were exiled and the first one was Pace. 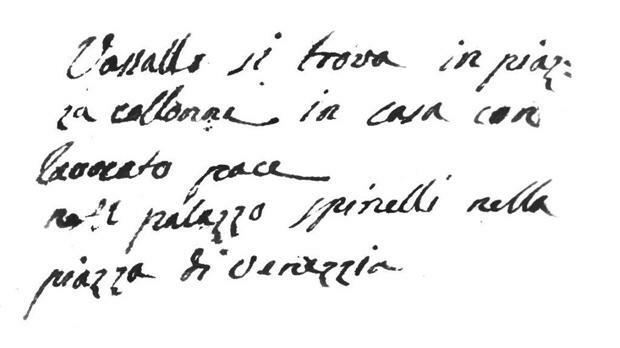 The same reason behind Pace’s exile is also confirmed a year later in a letter Inquisitor Giulio Carpegna wrote to the Papal Secretary of State on September 26, 1793. Carpegna was asked to give his opinion on a petition Pace had presented to the Pope to intervene for him with the Grand Master. After having examined the case and conducted several enquiries, especially with Uditore Bruno, Carpegna wrote to Rome that Pace was exiled the second time “for his statements that were in disagreement with the government which had already shown itself against him since he was considered as a person who created concern”. So it is quite clear that the reason behind Pace’s exiles was political. The notice published by the Istituto del Risorgimento, Rome, showing Pace as Minister for the Interior of the Roman Republic. It was during this second exile and his stay in Rome, that Pace met Vassalli and welcomed him at his house in Palazzo Spinelli, in Piazza Venezia. From contemporary diaries and newspapers published in Rome, it is known that Pace was in a ‘good’ financial position. Documents also prove that when confiscated buildings were sold in 1798-1799, his relative, Alberto, bought three houses in important locations in Rome to make un lecitissimo investimento. Moreover, Alberto was very close to the consuls, tribunes and higher officials in Rome. Thus, both Pace and his relative Alberto could offer some financial help to Vassalli’s literary projects. The later years of the 1790s were very critical for Rome, the rulers of the Papal States and their inhabitants. Pace was following what had been going on in France in the aftermath of the French Revolution of 1789 and the occupation of various Italian duchies and republics, including Parma and Lombardy. He was also aware of the consternation that arose in Rome after the death of General Mathurin-Léonard Duphot and how Napoleon Bonaparte was rapidly rising to absolute power. On February 10, 1798, the French arrived at the gates of Rome, led by General Louis-Alexandre Berthier. On that day, Pace led two other Jacobin friends, one of them from Naples, and erected the Pole of Liberty in three major squares of Rome; but Pace glorified himself by planting one on the Campidoglio. This immediately made Pace a public figure, and he was called a ‘Maltese’ from the very start. As soon as the French took over Rome and proclaimed the republic on February 15, Pace’s name was mentioned in contemporary newspapers, including the Monitore di Roma, besides diaries and memoirs of the day. When the republican constitution was then promulgated just five weeks later, Pace was appointed one of the civil, and later criminal judges of the republic. After serving about nine months as a judge, on November 15, 1798, Pace was appointed Minister of the Interior in a Cabinet of four. The ministry was considered highly important. His portfolio included national security, health, education and heritage, agriculture and food provision, and above all, the republic’s relationship with the Church authorities. During Pace’s term of office as Minister for the Interior, King Ferdinand IV of Naples invaded Rome to reinstall the Pope. But Ferdinand’s triumphant occupation in Rome was short-lived. In fact, on the following December 14, a counter-offensive by a huge French army of 70,000 troops compelled Ferdinand to withdraw to Naples. Pace was responsible to see to the reorganisation of the republican government in Rome. He was the first minister to enter on Christmas Eve and organise a glorious welcome for the consuls, generals, tribunes and the French forces. Diaries of the day describe how all these festivities, with all the security needed, disturbed the traditional, joyful Christmas festivities typical of Rome. As Minister for the Interior he also had to face the lack of provisions in the city. In fact, he personally visited the public bakeries to see that everything was in order, that no hoarding was taking place and that the prices were affordable for ordinary people. In the meantime, it seemed things were settling down and continued that way for some months. Changes to Cabinet ministers and other high authorities were made but Pace retained his position. He enjoyed the full trust of the generals. It was only on January 12, 1799, that he resigned from his post as minister and was appointed on the same day as administrator of the Luoghi dei Monti. This was a task “which was coveted by many others” states the Monitore of Rome . But it was only Pace who, at that moment, merited such a post. It seemed as well that his health had been giving him some concern. He was by now 52 years old. As financial administrator of this important region of the republic, he was responsible for the administration of the loans made to the government and to check whether the loans were honoured, since money was very much needed. Meanwhile, Ferdinand IV was preparing to take Rome again. He sought the support of Austria, and in mid-September 1799, attacked Rome. The French could do nothing in the face of such a powerful army, so they all fled to Marseilles or Corsica. Pace joined the tribunes, generals, consuls and others who left for Marseilles. There they met several of their counterparts who had fled from the Cisalpine Republic. This is confirmed by Antonio Galimberti’s entry in his diary on October 5, 1799. In February 1800, Napoleon became First Consul and the group from Rome implored him to be allowed to reach Paris, which they did a few days later. Pace’s whereabouts after this documented stay in Paris are not well known. What we know is that he came to Malta and lived close to his relatives in the vicinity of St Paul’s church and the Porto Salvo parish in Valletta. He might have followed the same way of life of his Roman colleagues, most of whom chose a quiet life or detested their republican past. We know that he married a lady named Rosaria. He died on November 18, 1720, in St Paul’s parish but was buried in the Porto Salvo parish in Valletta. Pace’s biography ends almost without a conclusion. When Vassalli returned to Malta from France on June 19, 1820, Pace was in his last five months of his life. Who knows whether they met and discussed the adventures they had lived during those fateful 20 years or more after they had last been together in Rome? Further research may discover something new in the near future. Dr Giuseppe Elia Pace, a Friend of Vassalli in Rome, by Carmelo Bonavia, will be presented by Dr Giovanni Bonello at a conference on Vassalli at Dar l-Ewropa, Valletta, on Wednesday at 6.30pm.